Creating a safe and secure environment for your home or business is more important today than ever before. At SB, we take your security needs seriously and work closely with you to build a system that not only secures your property effectively, but enhances it as well. 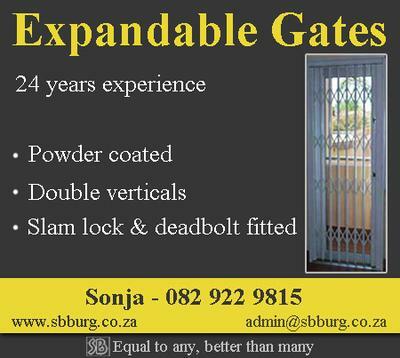 Our expandable gates are custom made and 2 locks are fitted for extra protection. There are 9 colours to choose from and installation is done by highly skilled personnel.